For my sophomore year math course I covered geometry. 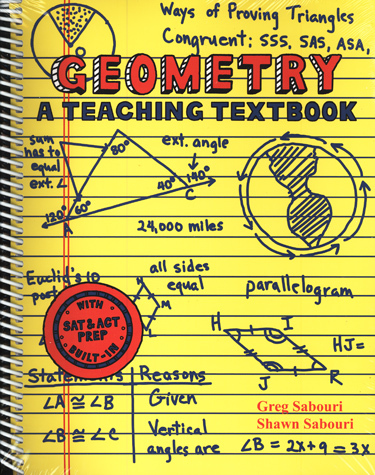 I used the Teaching Textbooks geometry materials, which included a textbook, solution manual, CD-roms, and test bank. The the whole course is disigned for home-based learners and includes full explanations of every lesson and full step by step problem set solutions. The CD-rom lectures repeat and expand on the text. I used them only when I didn’t completely understand what was going on from the text. Each problem set presented several problems on any new material, plus reviewed previous subjects covered. After each section I would take a timed section test. After the test I would review any material that I was still struggling with before moving on. By thoroughly covering this book, I learned about the history of geometry and logic, lines and angles, angle pairs and perpendicular pines, parallel lines, triangles, congruent shapes, inequalities, quadrangles, other polygons, similar shapes, right triangles and trigonometry, circles, area, solid geometry, coordinate geometry, linear questions, contractions, transformations, non-Euclidean geometries, and how all of these concepts relate to one another. Virtually every lesson had at least two proofs to do, as well as many other types of problems, such as logic and word problems, fill in the blank and true/false problems, and partial proof solution problems. The Teaching Textbooks are by far the best home-based math programs I have ever worked with.